The basic principle of the DC motor is a device which converts DC energy into mechanical energy. When the current carrying armature is connected to the supply end though commentator segment, brushes are placed within the North South Poles of permanent or electromagnets. By using these electromagnets operating principle is depends on the Fleming’s left hand rule to determine the direction of the force acting on the armature conductors of the DC motor. Speed of a DC motor can be varied by varying flux, armature resistance or applied voltage. Different speed control methods for different DC shunt and series methods are there. 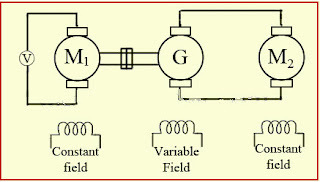 In this flux control method, speed of the motor is inversely proportional to the flux. Thus, by decreasing flux and speed can be increased vice versa. To control the flux , he rheostat is added in series with the field winding will increase the speed (N), because of this flux will decrease. So, the field current is relatively small and hence I2R loss is decreased. This method is quite efficient. So in this method, the speed can be increased by reducing flux, it puts a method to reducing flux with this method, it puts a method to maximum speed as weakening of flux beyond the limits will adversely affect the commutator. In the armature control method, the speed of the DC motor is directly proportional to the back emf (Eb) and Eb = V- IaRa. When supply voltage (V) and armature resistance Ra are kept constant, the Speed is directly proportional to armature current (Ia). If we add resistance in series with the armature, the armature current (Ia) decreases and hence speed decreases. This armature control method is based on the fact that by varying the voltage across the required voltage. The motor back EMF (Eb) and Speed of the motor can be changed. This method is done by inserting the variable resistance (Rc) in series with the armature. The basic equation of the armature control method, N is directly proportional to the V-ia (Ra+Rc) where Rc is controller resistance and Ra is the armature resistance. Due to the voltage back in the controller resistance the back EMF is decreased. Since N is directly proportional to the Eb. Multiple Voltage Control: In this method, the shunt field is connected to a fixed exciting voltage, and the armature is supplied with different voltages. So the Voltage across armature is changed with the help of a suitable switchgear devises. Armature speed is approximately proportional to the voltage across the armature. Ward-Leonard System: This Ward –leonard system is used where very sensitive speed control of the motor is required (e.g electric excavators, elevators, etc.). The arrangement of this system is as required in the figure shown below. M2 is the motor, it controls the speed of the generator. M1 may be any AC motor or DC motor with constant speed. G is the generator directly coupled to M1. In this method the output from the generator G is fed to the armature of the motor M2 whose speed is to be controlled. The generator output voltage can be connected to the motor M2 and it can be varied from zero to its maximum value, and hence the armature voltage of the motor M2 is varied very smoothly. Hence very smooth speed control of motor can be obtained by this method. Field Diverter : A Rheostart is connected parallel to the series field as shown in fig(a). This variable resistor is also called as a diverter, as desired value of the current can be diverted through this resistor and hence current through field coil can be decreased. Hence flux can be decreased to desired amount and speed(N) can be increased. Armature Diverter : Rheostat (Divider) is connected across the armature of the coil as shown in fig (b). For a given constant load torque, if armature current is reduced, then flux must increase. As armature torque Ta α ØIa. This will result in an increase in current taken from the supply and hence flux Ø will increase and subsequently speed of the motor will decrease. This tapped field control method is shown in fig (c). In this method, field coil is tapped dividing the number of turns. Thus we can select different value of Ø by selecting a different number of turns. In this method flux is reduced and speed is increased by decreasing the number of the turns of the series field winding. The switch S can be short circuit any part of the field winding, thus decreasing the flux and raising the speed (N) with full turns of coil. Paralleling Field Coils: This is used for fan motors several speed can be obtained by regrouping the field coils in series with the DC armature. 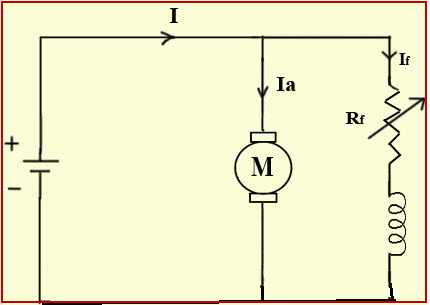 In this method, an introducing resistance (R) is series with the armature of motor.The voltage across the armature can be reduced. So the speed reduces in proportion with it. It is seen that for a 4 pole motor, the speed of the motor can be obtained easily. Series-Parallel Control Method: This type of the method can be widely used in electric traction, where two or more mechanisms coupled series motors are employed. If required low speed motors are joined in series, and for higher speed motors are joined in parallel. When motors are connected in series, the motors have the same current passing through them, although voltage across each motor is divided. When in parallel, the voltage across each motor is same, although current gets divided.